Kanpur is an important industrial city not only of state but also of country. The city area of Kanpur is approximately spread in 300 Sq. Kilometers. As the industries in Kanpur grew faster the village population also attracted towards the city. 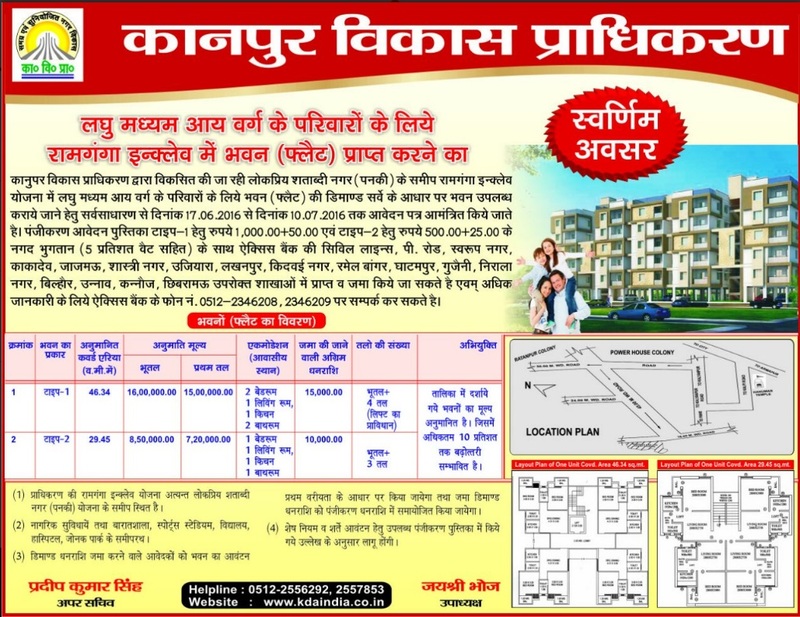 In present time the population of Kanpur city has crossed 30 lac. Noticing the rate of growth in population it has been decided that the development authorities should be constituted. According U.P. Urban Development Act 1973 Kanpur Development Authority has been constituted. The last date of the scheme has been extended to 20th March. Kanpur Development Authority launched new plots scheme in Shatabdi Nagar Phase 3, Shatabdi Nagar Phase 1, and Ratanpur Extension Part 2. Total 718 plots are announced by KDA in these areas. The minimum rate of these plots is Rs. 8,500.00/- per square metre are situated at 9 metre wide road.